STSA now accepts online donations for the James W. Brooks Medical Student Scholarship fund. The Brooks Scholarship was founded in 2010 to recognize and honor STSA Past President, Dr. Jim Brooks. Dr. Brooks was a lifetime supporter of the STSA, and he was a great mentor to countless residents and students during his career at the Medical College of Virginia. Make a Brooks Scholarship donation online. Download a Brooks Scholarship pledge form. The Brooks Scholarship is given annually to a promising 2nd, 3rd, or 4th year medical student interested in pursuing a career in cardiothoracic surgery and training in the STSA region (or training outside of the STSA region but who is nominated by an active STSA member). Scholarship recipients receive funding to attend the STSA Annual Meeting where they benefit from the guidance of STSA members. Since 2010, the Brooks Scholarship has funded the travel of seven medical student scholars to attend the STSA Annual Meeting where they are recognized and actively mentored by an STSA member. Each year, STSA receives dozens of applications for the Brooks Scholarship from accomplished and deserving medical students throughout the country. 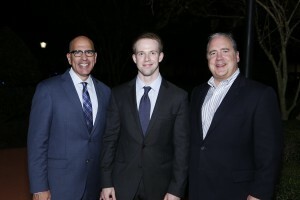 STSA Scholarship Committee Chair, Dr. Joe Dearani (left) attended an STSA 62nd Annual Meeting networking reception with his mentee and ’15 Brooks Scholar, Graham Ungerleider (center), and STSA Secretary/Treasurer, Dr. Daniel Miller (right). Donations made to the James W. Brooks Medical Student Scholarship will be used to fund the travel of future scholarship recipients. Donors are recognized on signage placed near registration at the STSA Annual Meeting. Login to your STSA user account to make a donation online or download a printable pledge form that can be mailed to STSA with a check. STSA will begin accepting applications for the 2016 Brooks Scholarship in May 2016. Learn more about the Scholarship and view a list past recipients.